TRIBAL MARKS : FOR BETTER OR FOR WORSE? Yesterday I had a Law of contract class,while I was trying to concentrate and listen to the lecture my mind drifted and all I could think about was the Tribal Mark on my Lecturers face. Now this woman has been teaching me since last year but I think I became interested yesterday. Still looking at her , I couldn’t help but notice she had three marks on each cheek. And as a result of my wandering thoughts I had to post something on it. I see so many people with this “annoying” mark and I’m like “Who did this to them” . Tribal Marks are an age-long art common to the Western part of Nigeria. The Egba, Nupe, Ilaje and other yoruba tribes commonly use these marks as a form of design, protection and beautification. With the help of sharp objects, flesh is cut from the skin to create a gash, which later heals and leaves a permanent mark on the body. An individual’s tribe or family typically dictates the pattern in which tribal marks are inscribed on their face, stomach and legs. In due course they returned, and he found that one slave had achieved successfully what he had been sent to do, while the other had accomplished nothing. The King therefore rewarded the first with high honours, and commanded the second to receive a hundred and twenty-two razor cuts all over his body. Sango therefore decided that cuts should in future be given, not as punishment, but as a sign of royalty, and he placed himself at once in the hands of the markers. However, he could only bear two cuts, and so from that day two cuts on the arm have been the sign of royalty, and various other cuts came to be the marks of different tribes. Now that we know the history of this, I’ll like to say this : I DON’T LIKE IT. Most times you see a very beautiful lady and next thing you see are deadly tribal marks … Unfortunately, nothing can be done to remove them. While surfing the net, I came across a popular Nigeria Website and this woman was really complaining about the marks on her face. She was actually looking for a solution. Her Grandfather gave her the mark when she was a kid. You see, in the olden days when a child was born, the proud father will want the child to be given tribal marks as a way of expressing that he is a legitimate child of the father and as a way of identifying the ethnic group. This tradition used to be really adored and recognised but nobody wants it no more. Now don’t get me wrong y’all.. 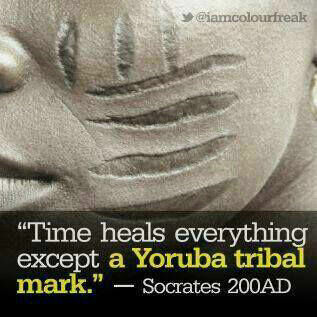 I know this Marks are part of the culture, heritage, beauty of the yoruba people – BUT IT IS FAR FROM ATTRACTIVE . I’m so glad I don’t see them on the faces of young people. I’m just stating my opinion, there are so many ways we could preserve our culture and traditions. Drawing lines on the face isn’t the way forward. Now you’ve read…what do you think about TRIBAL MARKS? Thank God. I thought I was the only one who detested them. They are utterly void of good sense. And what actually grieves me about them is that, most times, they are given to the bearer at a young age way before they can form or express any personal opinions about them. A man should be allowed to be responsible for things done to his own body. After scarring him for life, you’re not gonna wear his skin and walk around in it for him, if he ends up being uncomfortable in it.